La Brea Bakery Cafe has re-opened following renovations to the space. In addition to baked goods, there is a menu of soups, salads, sandwiches, burgers, pizzas and main dishes like wood-roasted trout with pepperonata and grilled brocollini. Read more on GAYOT's blog. La Brea Bakery Cafe, 468 S. La Brea Blvd., Los Angeles, CA 90036, 323-939-6813. Further evidence of Highland Park emerging out of the shadows is The Greyhound Bar & Grill, just opened on Figueroa Street. The clubby place offers shuffleboard in the back and flat-screen TVs at the bar, which serves classic cocktails. Bar food includes tandoori chicken wings, rib-eye nuggets, burgers and fries, fish and chips, and blackened salmon. Dinner nightly. The Greyhound Bar & Grill, 5570 N. Figueroa St., Los Angeles, CA 90042, 323-900-0300. Taking over the historic Art Deco building formerly housing Fatty’s in Eagle Rock will be Eagle Rock Brewery Public House, from the founders of Eagle Rock Brewery. After the initial debut of the dining room this spring, a 15-barrel brew house will be added to expand production of the well-regarded craft beer. A small plates menu is planned. Eagle Rock Brewery Public House, 1627 Colorado Blvd., Los Angeles, CA 90041, no phone. Innovative restaurateur Adam Fleischman (Umami Burger, 800 Degrees) is at it again, developing a concept that sounds completely weird but strangely delicious. ChocoChicken, serving fried chicken infused with chocolate, will debut in Spring 2014 in the downtown space previously occupied by Corkbar. House-made biscuits will be among the side dishes, and a full bar will be offered. A second ChocoChicken location is slated for Santa Monica. ChocoChicken, 403 W. 12th St. , Los Angeles, CA 90015, no phone. Restaurateur Paul Hibler (Pitfire Artisan Pizza, Superba Snack Bar) has collaborated with John Cao, Chloe Tran and Jason Neroni (Superba Snack Bar) to open the stylish French-Vietnamese restaurant East Borough in downtown Culver City. Open daily for lunch and dinner, menu highlights include crispy daikon cakes with sambal and hoisin aioli; daily oysters and king crab with Thai basil, bird's eye mignonette and calamansi mayo; head-on blue shrimp with pomelo and crab paste butter served with ginger rice; and pork shank with crab paste, lettuce cups, pickles and multiple condiments. Expect a select list of cocktails, white wine and rosé, as well as American craft brews and Belgian beers. Lunch & Dinner daily. East Borough, 9810 Washington Blvd., Culver City, CA 90232, 310-596-8266. Live Basil Pizza and Smashburger are now open at L.A. LIVE in downtown Los Angeles. Event attendees and locals can enjoy signature pizzas made with organic ingredients, including gluten-free and vegan choices. Pizzas are individually assembled and then baked in an open flame oven in approximately 150 seconds. Also, find fresh salads, craft beer and wine by the glass. Adjacent to Live Basil, Smashburger adds its fifth location to the Greater Los Angeles area. Its handcrafted “smashed,” seared and seasoned-to-order hamburgers are found in a dozen original burger creations, alongside fresh tossed salads, milkshakes and local craft brews. Breakfast, Lunch & Dinner daily. Live Basil Pizza/Smashburger, 800 West Olympic Blvd., Los Angeles, CA 90015, 213-746-5483. Piccolo Group’s executive chef Bobo Ivan and restaurateur Vittorio Viotti have opened the fast-casual gourmet delicatessen CiBOTECA in Santa Monica. Expect panini, salads, and dishes like pork belly bun baked in duck fat; smoked salmon with mushrooms, arugula and mascarpone; and tuna conserva with celery root, candied beets and olives. Ivan partners with Piccolo pastry chef Yukari Kamiya for desserts featuring green tea tiramisu and bite-size orange, rum and sesame chocolates. Breakfast, Lunch & Dinner daily. CiBOTECA, 606 Broadway Ave., Santa Monica, CA 90401, 310-458-3366. Chianina Steakhouse has debuted in the Naples area of Long Beach, a venture of Michael’s Restaurant Group, which operates Michael’s on Naples Ristorante. The concept is an upscale boutique steakhouse named after the Italian breed of cattle originally used for bistecca alla fiorentina. Starters include crispy pork belly with caramel apple purée, a tasting of Piedmontese and Prime beef carpaccio, and crudo. Both Piedmontese and Prime steaks are offered with various sauces, as well as some seafood dishes. Dinner Tues.-Sun. Chianina Steakhouse, 5716 E. Second St., Long Beach, CA 90803, 562-434-2333. Recently opened in South Pasadena is Crossings, a venture of Patrick Kirchen, a veteran of La Grande Orange Cafe and the Patina Group, and former Parkway Grill chef Lalo Sanchez. Danielle Keene is the pastry chef at the two-level restaurant in South Pas’ Edwards & Faw building on historic Mission Street. Starters at the upscale restaurant include ahi poke with jalapeño, persimmon paired with burrata, and oxtail sliders, while entrées entail black cod with couscous, chorizo and piquillo peppers; steaks and Moroccan chicken. Dinner nightly. Crossings, 1010 Mission St., South Pasadena, CA 91030, 626-799-7001. Vegan Mexican restaurant Gracias Madre has opened in West Hollywood. Gracias Madre, 8905 Melrose Ave., West Hollywood, CA 90069, 323-978-2170. Chef Brian Malarkey, who operates Herringbone and Searsucker in the San Diego area, has opened Herringbone at the Mondrian Los Angeles. 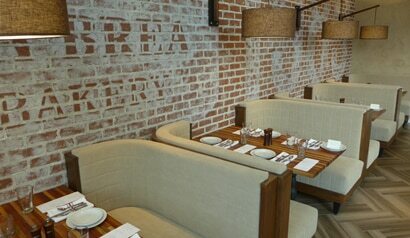 Herringbone, Mondrian, 8440 Sunset Blvd., West Hollywood, CA 90069, 323-848-6000. Culver City neighborhood café (and pub) The Wilde Thistle has opened. A pan-Celtic menu includes signature scones (triple ginger, Scottish oat, cherry chocolate), traditional pasties, a Ruben sandwich, and a smoked salmon plate, as well as a full afternoon tea (by reservation), pub fare and wine and craft beers. The Wilde Thistle, 3456 Motor Ave., Los Angeles, CA 90034, 310-730-6208. Burbank’s chic new spot for globally inspired small plates is Commonwealth, right near City Hall. Expect elegant selections including daily oysters, grilled octopus and Brussels sprouts with chili and fresh mint, pink snapper carpaccio, chilled duck breast with yuzu kosho, arugula and roasted cauliflower with pine nuts, and fried chicken with maple Dijon. Dinner Tues.-Sun. Commonwealth, 222 S. Glenoaks Blvd., Burbank, CA 91502, 818-845-2225. Superba Snack Bar owner Paul Hibler has announced Jason Travi (littlefork) as executive chef and Jason Neroni (Superba Snack Bar) as consultant for his latest Venice-based, spin-off project, Superba Food + Bread. Set to open in February on Lincoln Boulevard, the restaurant will feature New American cuisine for breakfast, lunch and dinner, and will highlight artisan breads delivered to locals by bicycle in the afternoons. Expect pastries, sandwiches and salads for lunch; dinner items will include pot pie with smoked turkey, pearl onions, carrots and a scallion and cheddar crust, as well as beef rib pot roast with rutabaga, stout, sour cream and caraway. Dessert features rhubarb pie with hyssop cream. Breakfast, Lunch & Dinner daily. Superba Food + Bread, 1905 Lincoln Blvd., Venice, CA 90291, no phone. Australian celebrity chef Curtis Stone's first restaurant, Maude, will open to the public on February 1, 2014. It is located in the former Pici Enoteca space. Maude, 212 S. Beverly Dr., Beverly Hills, CA 90212, 310-859-3418. Tom Bergin’s Tavern, which originally opened in 1936 and closed last July, re-opened in January after being purchased by a longtime regular customer. The new owner is dedicated to revitalizing the legendary Irish pub. Tom Bergin’s Tavern, 840 S. Fairfax Ave., Los Angeles, CA 90036, 323-936-7151. The Six has opened a third restaurant in Calabasas (the others are in West L.A. and Studio City) with a continued rustic/recycled vibe and Slow Food ethos. Expect the likes of smoked trout salad, braised short rib, salmon cakes with Thai citrus aioli, pumpkin pizza, and slow-rosted chicken pot pie. To drink, find craft beers on draft and in bottles, and select, mostly Californian wines. Lunch & Dinner daily, Brunch Sat.-Sun. The Six, 23536 Calabasas Rd., Calabasas, CA 91302, 818-222-6969. In Santa Monica, the Spanish Manchego has moved down the street to the former Café Noir space and has also acquired a beer and wine license. Expect Spanish favorites including gazpacho, jamón-wrapped dates, bocarones, octopus with garlic and tomato sauce, and albondigas in fenugreek sauce. Dinner nightly. Manchego, 2518 Main St., Santa Monica, CA 90405, 310-450-3900. Attached to the Mysterious Galaxy bookstore in Redondo Beach, Cork’er offers a gourmet gastropub take on U.K. favorites and other farm-to-table dishes. Expect shepherd’s pie and corned beef and cabbage, alongside spicy pulled pork and fingerling potatoes with bacon jam. Coming from Larry Killian, formerly of the nearby Killian’s Irish Pub, there’s also a wide selection of local craft beers, select California wines and organic coffee and teas. Breakfast, Lunch & Dinner daily. Cork'er, 2810 Artesia Blvd., Redondo Beach, CA 90278, 310-499-2480. A new American gastropub, R10 Social House, has opened in Redondo Beach right in the marina. Named after a deep channel buoy, the neighborhood restaurant offers a seasonal, market-driven menu featuring items like oysters with mignonette, mussels in curry broth, jidori chicken and waffles, and a gourmet burger. Expect contemporary craft cocktails like the Penicillin (Scotch, lemon juice, honey and ginger) and more fanciful concoctions of house-infused strawberry mash with Sipsmith gin, elderflower liqueur and bubbles. Dinner nightly. R10 Social House, 179 N. Harbor Dr., Redondo Beach, CA 90277, 310-798-2500. Lemonade, a cafeteria-style concept known for its seasonal comfort food, has opened a new Studio City branch. Founded by chef Alan Jackson, Lemonade’s diverse selection of dishes --- many of them relatively healthy --- has fueled the chain's rapid expansion, with more than a dozen Southern California locations. Lunch & Dinner daily. Lemonade, 12401 Ventura Blvd., Studio City, CA 91604, 818-985-5700. Renowned Miami restaurateur Barton G. Weiss (Barton G. The Restaurant) has brought a dramatic 3,200-square-foot outpost of Barton G. The Restaurant to La Cienega in West Hollywood. 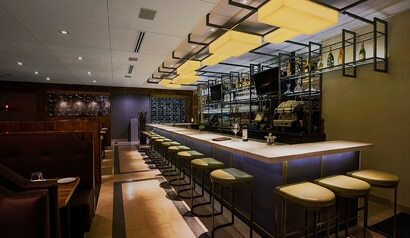 The kitchen offers stylized, iconic American dishes including lobster pop tarts, Samurai tuna, and Voodoo shrimp rolls. Avant-garde cocktails feature herbal-based recipes of fruit and vegetable bouillons, infusions, purées and extractions. 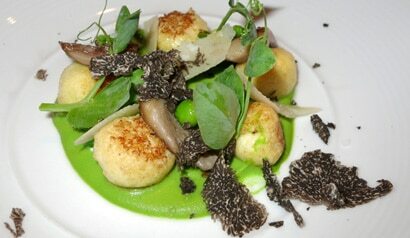 Barton G. The Restaurant, 861 N. La Cienega Blvd., Los Angeles, CA 90069, 310-388-1888. The Trois Mec team --- Jon Shook and Vinny Dotolo (Animal, Son of a Gun) and Ludo Lefebvre (LudoBites) --- will open a sister establishment next door called Petit Trois. Check in here to track its progress, and look for a summer 2014 opening. Petit Trois, 718 N. Highland Ave., Los Angeles, CA 90038, no phone. Emmy-award-winning actress and philanthropist, Sofia Vergara joins forces with Buca di Beppo for the Meatballs 4 Niños campaign that aims to raise money and awareness for St. Jude Children’s Research Hospital. Buca di Beppo will donate $1 to St. Jude for every meatball appetizer, entrée and side dish served in the restaurant (it will also apply when guests order Buca-to-Go.) Buca di Beppo is best known for their half-pound meatballs, which are made fresh daily. Buca di Beppo, 80 W. Green St., Pasadena, CA 91105, 626-792-7272. The annual Truffle Dinner Series at SAAM at The Bazaar by José Andrés will continue with the debut of this year’s black truffles starting February 13 and will run through March 15. To learn more about it go to GAYOT's Blog. SAAM at The Bazaar by José Andrés, SLS Hotel at Beverly Hills, 465 S. La Cienega Blvd., Los Angeles, CA 90048, 310-246-5545. San Diego’s Cohn Restaurant Group will recreate its Bo-Beau concept in Long Beach this winter with Bo-Beau Kitchen + Rooftop on Pine Avenue. It is expected to serve a Cal-French menu similar to its San Diego location, with charcuterie, oysters on the half shell, flatbreads from a wood-fired oven, various moules frites preparations, pastas and bistro entrées like steak frites and beef bourguignon. A rooftop beer garden may offer a lighter menu, complemented by 50 beers and tap and more than 100 vodkas. Bo-Beau Kitchen + Rooftop, 144 Pine Ave., Long Beach, CA 90802, no phone. Top Chef alum Michael Voltaggio (ink.) is collaborating with Umami Burger to host a guest appearance of his new signature burger at Umami locations nationwide. Voltaggio’s new Monte Cristo Burger is priced at $15, of which $1 from each burger will be donated to the Los Angeles Mission. It's a beef burger topped with Gruyère fondue and prosciutto, and served with a custard-soaked and fried Umami bun, dusted with powdered sugar and served with maple syrup on the side. The burger will be available for a limited time, but Umami’s series of “guest chef” burgers will continue (the previous signature patty was dreamed up by rock legend Slash). Umami Burger, 4655 Hollywood Blvd., Los Angeles, CA 90027, 323-669-3232. West Hollywood’s upscale Chinese eatery Chi Lin is celebrating Chinese New Year with 50 percent off chef Tyson Wong’s modern take on traditional Chinese cuisine February 2–6. Dishes to nosh on for an auspicious Year of the Horse include pea leaf and water chestnut dumplings with gingered soy sauce, “long life” hand-pulled noodles with fresh black truffles, and an eight-hour lacquered Peking duck, carved and served with plum sauce, cucumbers and scallions. The special offer applies to food only. Chi Lin, 9201 Sunset Blvd., West Hollywood, CA 90069, 310-278-2068. Chef Walter el Nagar is bringing his "New Wave Italian" cuisine to Hollywood with his Barbershop Ristorante pop-up at The Farmer's Kitchen through February 2014. 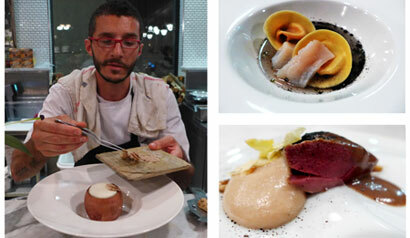 At his previous pop-up in Venice, diners enjoyed dishes like crab risotto with huitlacoche and stracchino cheese. Barbershop Ristorante, The Farmer's Kitchen, 1555 Vine St., Los Angeles, CA 90028, 424-272-5849. After five years at the SLS Hotel, The Bazaar by José Andrés will soon be making some changes --- expanding The Bazaar into the hotel’s front retail lobby and transforming the more formal SAAM into a livelier tasting bar space like Andrés' Washington D.C. restaurant minibar. The Bazaar by José Andrés, SLS Hotel at Beverly Hills, 465 S. La Cienega Blvd., Los Angeles, CA 90048, 310-246-5555. Porto’s Bakery, the Glendale-based Cuban-American enterprise with a near cult following, has announced another round of expansion, to West Covina and Anaheim, which will bring its total number of locations to five. Breakfast, Lunch & Early Dinner daily. Porto's Bakery, 315 N. Brand Blvd., Glendale, CA 91203, 818-956-5996. Chef Warren Schwartz, formerly of Westside Tavern and Whist, is serving seasonal California fare at Warren's Blackboard at The Beverly Garland hotel. Warren's Blackboard, The Beverly Garland Hotel, 4222 Vineland Ave., North Hollywood, CA 91602, 818-255-7290. The popular Japanese restaurant on Sawtelle Robata-Ya has closed. It may be replaced with an izakaya spot in the near future. Robata-Ya, 2004 Sawtelle Blvd., Los Angeles, CA 90025, no phone. Longtime downtown favorite sushi spot R23 is temporarily closed for renovations. There's presently no word on when it will reopen. R-23, 923 E. Second St., Los Angeles, CA 90013, 213-687-7178. Celestino Drago’s Enoteca Drago has closed. It was among the first restaurants to introduce the small plates enoteca concept to L.A. Enoteca Drago, 410 N. Cañon Dr., Beverly Hills, CA 90210, no phone. 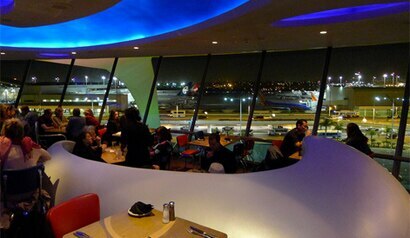 Encounter Restaurant, which was perched up in the Los Angeles International Airport's Theme Building, has closed. According to the restaurant's web site, their contract with LAX ended as of December 31, 2013. Encounter Restaurant, Los Angeles International Airport - LAX, 209 World Way, Los Angeles, CA 90045, no phone. The brick-and-mortar incarnation of Cousins Maine Lobster located at Live Mixx in Pasadena has now closed, but the two popular Cousins Maine Lobster Trucks that spawned it are still rolling strong. Cousins Maine Lobster at Live Mixx, 115 E. Colorado Blvd., Pasadena, CA 91105, no phone. The upscale, modern Indian restaurant Tanzore has closed its doors on La Cienega, due to problems renewing its lease with the landlord. Tanzore, 50 N. La Cienega Blvd., Beverly Hills, CA 90211, no phone. Only one Hamlet Restaurant (formerly and more famously known as Hamburger Hamlet) remains in the area --- the sole Southern California survivor is in Sherman Oaks --- after the January 3 closing of the Pasadena location. The space was not vacant for long, as another L.A. institution, Du-Par’s, opened its doors the very next day. The Pasadena Hamlet was a fixture on Lake Avenue since 1967. Hamlet Restaurant, 214 S. Lake Ave., Pasadena, CA 91101, no phone. Chef/owner Bryant Ng has shuttered The Spice Table in Little Tokyo. The restaurant will be demolished in order to build a new subway station. Ng and his wife, Kim, are partnering with Josh Loeb and Zoe Nathan (Rustic Canyon Wine Bar & Seasonal Kitchen, Milo & Olive, Huckleberry Cafe & Bakery, Sweet Rose Creamery) on a new Santa Monica restaurant to open in the summer of 2014. The Spice Table, 114 S. Central Ave., Los Angeles, CA 90012, no phone. Santa Monica's Ocean Park Omelette Parlor closed in December 2013. Ocean Park Omelette Parlor, 2732 Main St., Santa Monica, CA 90405, no phone.